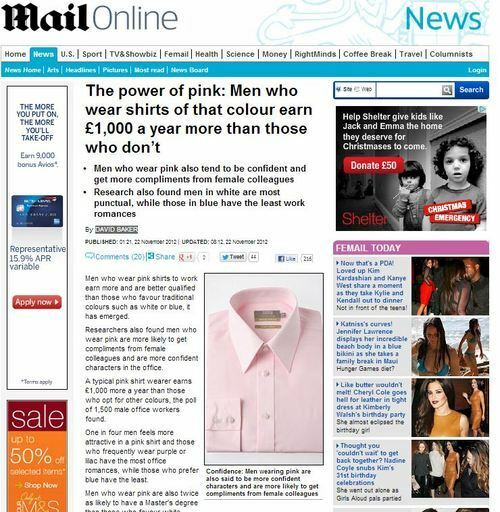 Men who wear pink shirts to work earn more and are better qualified than those who favour traditional colours such as white or blue, it has emerged. Researchers also found men who wear pink are more likely to get compliments from female colleagues and are more confident characters in the office. The story was also picked up by The Independent and The Telegraph. Who were the researchers undertaking this valuable research? Stephanie Thiers-Ratcliffe, International Marketing Manager for Cotton USA, which commissioned the study, said: ‘You can tell a lot about someone by the colour they wear. It isn’t hard to see why a cotton spokesperson might have an interest in reminding us of the value of a nice cotton shirt. Plugging the press release into Churnalism.com, it’s clear that the Daily Mail’s David Baker had a laid-back morning on the 22nd, taking a whopping 84% of his article directly from the press release. Not too far behind him was Mark Reynolds of the Daily Express, who took 67% of his article from the press release. One in four men feels more attractive in a pink shirt and those who frequently wear purple or lilac have the most office romances, while those who prefer blue have the least. 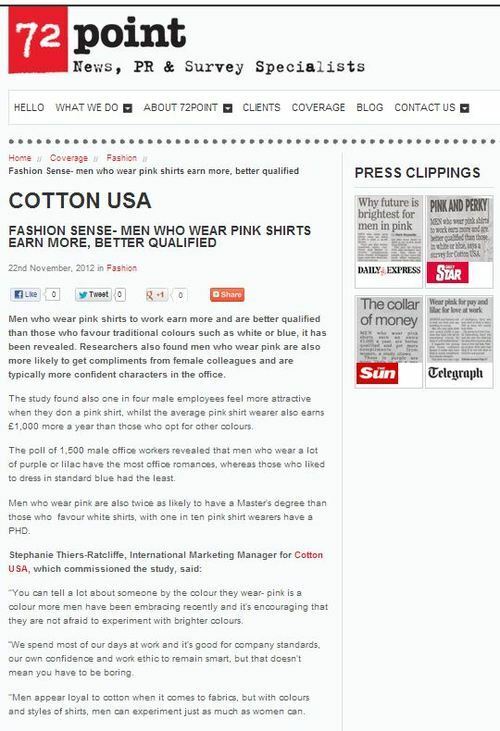 Men who wear pink are also twice as likely to have a Master’s degree than those who favour white shirts, with one in ten pink shirt wearers having a PHD. The report also found men who favour shirts with green tones are the most likely to be late for work, whilst white shirt fans are the most punctual, the survey found. And if you are trying for a promotion then it’s best to dress in a purple shirt, it emerged. So it may well be that the colour of your shirt dictates certain attributes about your life… or it may well be that if you ask enough questions, you’ll gather enough data to be able to mine your way to a raft of meaningless conclusions. Also, can you spot the glaring flaw? I’ll give you a hint: since when did anyone ever wear the same shirt colour every day…? This entry was posted in Uncategorized and tagged 72 point, daily express, daily mail, daily star, david baker, independent, Mark Reynolds, onepoll, rob williams, Stephanie Thiers-Ratcliffe, telegraph, the sun on November 23, 2012 by Michael Marshall.